Wasps have signed experienced prop forward Paul Doran-Jones from Premiership rivals Gloucester. 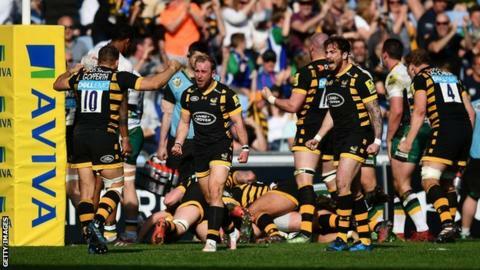 The 32-year-old, who can play in both prop roles, joins for a third time, having also been with Wasps in 2008 and again briefly on loan last season. In addition, Wasps have signed 23-year-old tight-head prop David Langley from National League 1 side Cambridge. But loose-head prop Tom Bristow is to leave after two seasons with the club following his move from Leicester. Doran-Jones, who won six caps for England in 2009, is a former schoolmate of Wasps, England and Lions flanker James Haskell. "After spending some time at the club on loan this year, I'm really looking forward to linking back up with them and working under Dai Young," he said. "In the time I spent there, I was really impressed with the set-up. There's a great group of props at the club." Langley has already represented Wasps at A League level this season, helping them reach the semi-finals, and has now been rewarded with a full-time development contract. "It is a massive opportunity for me," he said. "From a player who hasn't been through the academy system, I owe a great deal to the clubs that have supported me along the way, South Woodham, Colchester and Cambridge. "It just goes to prove that with enough hard work and dedication, anybody can achieve their dreams. But I appreciate that joining a Premiership club means the hard work has only just begun." Meanwhile, two former Wasps players, flanker Matt Everard and Italian international centre Andrea Masi, have returned to the club as Academy coaches, along with former Yorkshire Carnegie Academy manager Jonathan Pendlebury.